SMV 290: the cubic monitor. The Seleco 28 videowall monitor SMV 290 is a versatile and robust video display. It is characterised by its rugged metal cubic case, which is easily stackable up to a maximum of 12 monitors. The Black Matrix FST tube guarantees excellent performances in terms of convergence, purity and contrast, which results in a monitor particularly suitable for videowall applications. 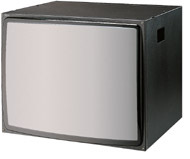 Due to the stylish cabinet, the SMV 290 can also be used as a stand alone video display. The Seleco videowall monitors assure a bright and sharp picture with excellent color balance, they are easy to move being provided with carrying handles and easy to maintain as well. Preset for Brightness; Contrast; Color Saturation; amplitude H and V, shift H and V, trapezium, E-W and vertical linearity; Horizontal phase (TTL in).